Scientist Emil Hamilton was a friend of SUPERMAN. 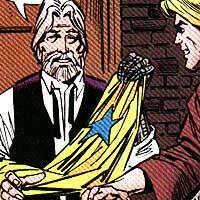 Superman has turned to Hamilton for assistance on a number of occasions, as his scientific expertise is superb. Booster Gold first encountered Emil Hamilton when the scientist was among the SHADOW FIGHTERS who battled ECLIPSO on the moon. Much later, Hamilton would aid Booster by reconstructing a new power suit based on the technical specifications of Booster's 25th-century suit. 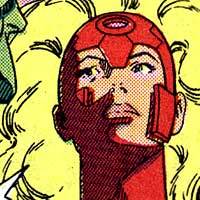 The personal historian of the original Monitor during the Crisis on Infinite Earths, Lyta the Harbinger's duty was to record all of the events in the universe. Booster Gold and Harbinger both attended the ceremony announcing the plan of the GUARDIANS OF THE UNIVERSE to evolve their "chosen" humans (see NEW GUARDIANS). It was Harbinger who encouraged MARTIAN MANHUNTER and the JUSTICE LEAGUE not to give up on Booster Gold after Booster appeared to turn traitor against the HEROES OF THE MILLENNIUM by joining the MANHUNTERS. RIP HUNTER, Time Master, keeps a secure laboratory in the Arizona desert. The lab serves both as a research laboratory, machine shop, garage for Hunter's Time Spheres, and a base of operations for Hunter and Booster Gold. 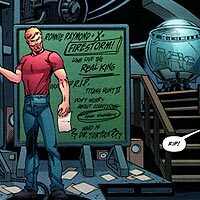 Hunter frequently leaves notes on his chalkboards that indicate clues to current and future events throughout the DC Universe. Despite the impressive security measures, the base has been invaded by villains such as MISTER MIND, REX HUNTER, and STARRO THE CONQUEROR.